Christmas is a time of tradition, and throughout my early childhood I recall a certain Christmas gift that kept on giving. 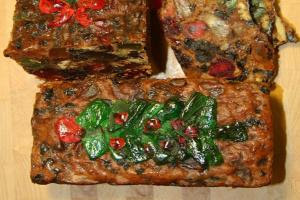 A fruitcake similar to the one shown here survived being passed around to close family members for decades. This was a running family joke centered around one fruitcake that was giftwrapped and mailed just before Christmas to an unsuspecting family member on the Parkman side of Mom’s family. The rules were you did not eat the fruitcake, but were instead the guardian of the wrapped gift for a full year until time to forward it to another close family member. The Christmas gift that kept on giving arrived at our home one year sometime between 1955 and 1959 because I was probably at least 6 but not older than 10. It had already made the rounds for a decade or more, and certainly provided a lot of smiles as we learned the family tradition and why it was not for eating. Mom fulfilled her obligation and shipped it out to another relative a year later. From that time, the tradition may have continued for another decade though I believe it since stopped. I happen to like fruitcake. The recipe probably goes back at least several hundred years, and I believe a freshly made fruitcake is supposed to taste that old, too. Sorta like fine wine. Or not.